The Gauldur Amulet was originally owned by the powerful wizard Archmage Gauldur during the First Era. His three sons Jyrik, Sigdis and Mikrul grew resentful of their father's power and murdered him in his sleep sometime during the reign of High King Harald (1E 143-1E 221). They divided his amulet between them and laid waste to the surrounding villages until the High King sent Archmage Geirmund and a company of battlemages to stop them. After the three brothers were defeated, they were sealed away with the pieces of the amulet. The High King ordered that the whole affair be struck from the rolls of history, fearful of the terrible power of Gauldur's amulet, but the "Forbidden Legend" managed to live on through the ages. For more information, see the lore article. A Dunmer mage known as Daynas Valen dedicated his life to searching for the amulet, discovering the past and locating the fragments of the Gauldur Amulet. Once you get all three fragments, you can reforge it back into The Gauldur Amulet, which provides the bonuses of all three pieces. 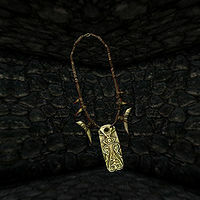 The Gauldur Amulet and fragments cannot be disenchanted. Legitimately obtained copy of the amulet is fully permanent. Sometimes you may be able to wear this in addition to another necklace. Sometimes the enchant can have two effects at once. This results in having +60 Magicka, Health, and Stamina. ?